February 5 – February 19, 2019 begins the Lunar New Year 4717. The Year of the Pig. Costumes and accessories from Etoile Costume & Party Center for the New Year celebrations. We have retail costumes and accessories as well as authentic costumes and headpieces brought back from a trip China by one of the owners a few years ago. We also carry decorations, lanterns, signs and noise makers. Chinese New Year fireworks will open the event for the Chinese New Year festival. The sound of firecrackers tells people the new year has arrived. People offer the New Year’s greetings while they are watching TV shows, enjoying the fireworks, asking luck at temple or gambling. The most popular greeting is Gong Xi Fa Chai Gong Xi Fa Chai (Cantonese pronounces Gong Hay Fat Choy), which means “congratulations and make a fortune.” The firecracker and congratulations greeting are from the story of animal Nian. “Make a fortune” is to wish people rich, because Chinese love to talk about money. Many Chinese families worship the God of Land every 2nd and 16th lunar day. This is the first time of the year to worship the God of Land with animal offerings and ask for safety and luck. Some Chinese will eat dumpling because its shape like ancient Chinese money – gold ingot. Red Dog is the name of the God of Anger, who brings bad luck to people. So people don’t like to go out on this day, otherwise they can lose temper easily and have argument with others. After 4-day vacation, people are ready to go back to work. Most of companies will open business on the 5th lunar day. Many Chinese always select an auspicious hour from Chinese Farmer’s Calendar to open the company door. This day is the death anniversary of the Clear-Water Grand Master. The Master was a monk in Sung dynasty. Human Body According to Chinese genesis, the goddess with snake body (2852-2738 B.C.) created chickens on the first day of the first lunar month, dogs on the 2nd day, sheep on the 3rd day, pigs on the 4th day, cows on the 5th day, horses on the 6th and humans on the 7th day. The holiday for government and business company ends on the 5th lunar day. But some people take long days off until 8th lunar day. God of DaoismAccording to Taoism (Daoism), the Jade Emperor lives in the 33rd heaven and governs 33 heavens; so he is the king of heavens. Jade Emperor is a vegetarian. To celebrate his birthday, Chinese prepare three bundles of long noodle, three tea cup with green tea, five different kinds of fruit and six different kinds of dry vegetables to worship Jade Emperor. On the next day of the Jade Emperor’s birthday, there are many foods left from the birthday’s ceremony. People have to take care all the vegetable, animal sacrifices, cakes and fruit on the 10th lunar day of the year. There is no special event on the 11th lunar day. Some families will invite daughter and son-in-law back to the house to enjoy the final meal left from Jade Emperor’s birthday feast. Many people keep eating with greasy food from Chinese New Year Eve for 11 days. They might have a trouble for diarrhea on this day. For some people have to begin to prepare the Lantern Festival, which is on the 15th lunar day. All the festival food probably is gone on the 13th lunar day of the year. People just eat something simple on this day. This day is also the death anniversary of General Kuan Yu. Some Chinese will visit the temple of General Kuan to pray for safety and money luck. The day before the Lantern Festival, the Lantern Display stage will be building on the open square in the front of temples. People will bring their designed lantern to the display stage for the competition. A dedicate delicate lantern might take more than a month to complete. The ancient lantern has a candle inside to keep it bright. The Lantern Festival is called Yuan Xiao Festival in China. This is because Chinese eat Yuan-Xiao on this day. The Lantern Festival is also called San-Yuan UpperDollar (upper period of the year) Festival in Taoism. This day is the birthday of the Heaven Officer who blesses human luck. So many people have a worship ceremony at home and some go to Taoism temple pray for luck. The Lunar New Year Festival is the most significant holiday for Asian people around the world, regardless of the origin of their ancestors. The holiday is a very jubilant occasion mainly because it is the time when people take a break from work to get together with family and friends. New Year celebrations can last for 2 weeks. 7 blocks along Garvey Avenue, Monterey Park, CA. 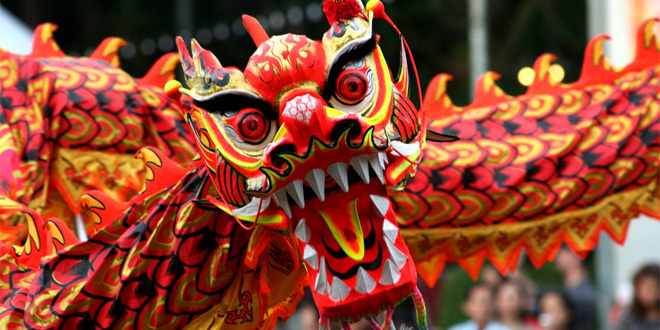 Click on the dragon above to visit the official website for the Golden Dragon Parade. Even though Lunar New Year celebrations generally only last for several days, starting on New Year’s Eve, the festival itself is actually about three weeks long. It begins on the twenty-fourth day of the twelfth lunar month, the day, it is believed, when various gods ascend to heaven to pay their respects and report on household affairs to the Jade Emperor, the supreme Taoist deity. According to tradition, households busily honor these gods by burning ritualistic paper money to provide for their traveling expenses. Another ritual is to smear malt sugar on the lips of the Kitchen God, one of the traveling deities, to ensure that he either submits a favorable report to the Jade Emperor or keeps silent. Next, “spring couplets” are hung up around the house. Spring couplets are paper scrolls and squares inscribed with blessings and auspicious words, such as “good fortune,” “wealth,” “longevity,” and “springtime.” The paper squares are usually pasted upside down, because the Mandarin Chinese word for “upside down,” tao, is a homonym of the word “arrival.” Thus, the paper squares represent the “arrival” of spring and the “coming” of prosperous times. On lunar New Year’s Eve, family members who are no longer living at home make a special effort to return home for reunion and share in a sumptuous meal. At that time, family members hand out “lucky money” in red envelopes to elders and children and stay up all night to welcome the New Year. Chinese people have long believed that staying awake all night on New Year’s Eve would help their parents to live a longer life. Thus, lights are kept on the entire night–not just to drive away Nien, as in ancient times, but also as an excuse to make the most of the family get-together. Some families even hold religious ceremonies after midnight to welcome the God of the New Year into their homes, a ritual that is often concluded with a huge barrage of firecrackers. On the day itself, an ancient custom called Hong Bao, meaning Red Packet, takes place. This involves married couples giving children and unmarried adults money in red envelopes. Then the family begins to say greetings from door to door, first to their relatives and then to their neighbors. Like the Western saying “let bygones be bygones,” at Chinese New Year, grudges are very easily cast aside. Tributes are made to ancestors by burning incense and the symbolic offering of foods. As firecrackers burst in the air, evil spirits are scared away by the sound of the explosions. It is a 15 day celebration, beginning on the first day of the new moon, and ends on the full moon. The celebration on the 15th day is called the Lantern Festival, which is a celebration with singing, dancing and lantern shows. At the Festival, all traditions are honored. The predominant colors are red and gold. “Good Wish” banners are hung from the ceilings and walls. The “God of Fortune” is there to give Hong Baos. 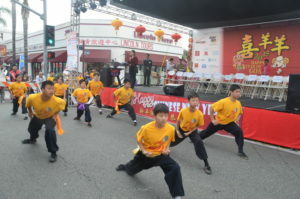 Lion dancers perform on stage continuously. Visitors take home plants and flowers symbolizing good luck. An array of New Years specialty food is available in the Food Market. Visitors purchase new clothing, shoes and pottery at the Market Fair.